Profile Manager is an exclusive EMDK technology offered within your IDE, providing a GUI based development tool. This allows you to write fewer lines of code resulting in reduced development time, effort and errors. Inside your IDE, select an open Android project. 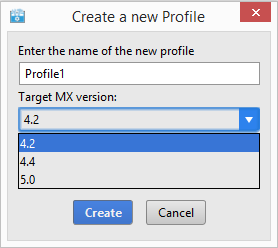 NOTE: Profile manager will create a profile xml file and add it to your project. Selecting and open project will tell profile manager which project you want the profile added to. Select "EMDK" -> "Profile Manager" on the tool bar. 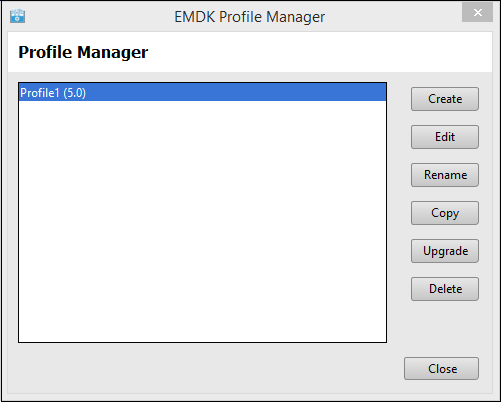 Open the "EMDK Profile Manager". Enter a name for your new Profile. This name is how the profile will be identified by the EMDK. 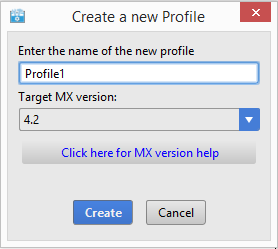 Select the MX version you would like to use in your profile. Use the Choosing a MX Version Guide as an aid to decide which MX version to use. Select the features you would like to enable by selecting the item from the list of "Available Features" and clicking the right arrow button. You must enable both a Data Capture Delivery Feature and a Data Capture Input Feature for the profile to send data to your application. For example "Barcode" and "Intent". You can remove a feature from the "Selected Features" list by clicking the left arrow button. Select a "Selected Features" and the list of parameters will populate on the right hand side of the dialog. When you click on a parameter a description with populate on the lower left hand corner of the dialog. The profile XML will be generated and saved to "EMDKConfig.XML" inside your projects "assets" folder. 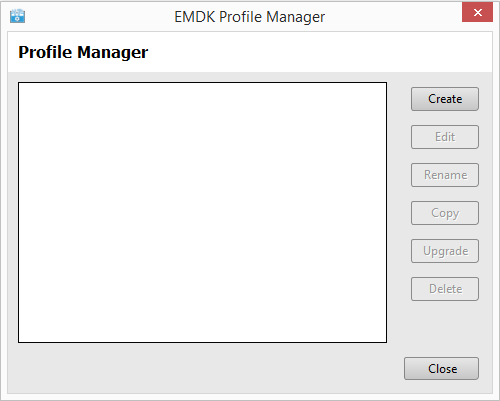 Open the EMDK Profile Manager. Select a Profile to modify and click "Edit". 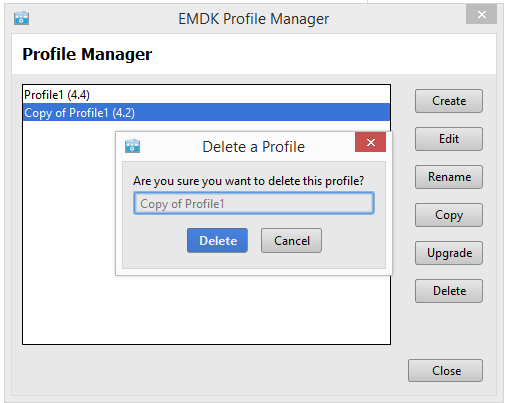 Edit the profile using the Profile Manager in the same way you would when creating a new profile. The profile XML will be updated and saved to "EMDKConfig.XML" inside your projects "assets" folder. Select a Profile to rename and click "Rename". Select a Profile to copy and click "Copy". 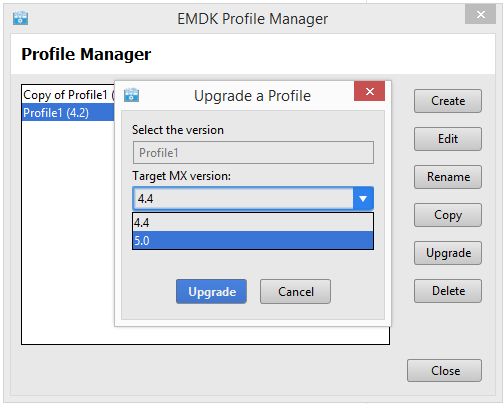 Note: The Profile Manager does not provide a method to downgrade a profile, so the upgrade process is not reversible. It is advised that you make a copy of your profile before upgrading. Select a Profile to upgrade and click "Upgrade". Select a Profile to delete and click "Delete". Once you create your profiles using the Profile Manager, they will be bundled with your application and available to access using the Profile Manager APIs. These profiles will NOT be applied on the device until it is processed using these APIs. Document - data will be handled as a XML Document. String - data will be handled as a raw string. ProfileConfig - data will be handled as a ProfileConfig class. A profile is created or activated with using the PROFILE_FLAG.SET option. If the profileFlag is set to SET, and if the given profile is not available, it will look for a valid profile in the extraData argument and if present, the profile will be added to the internal XML volatile repository and also applied to the device. If the profile is present, then it will be applied to the device. Note: The following example uses ProfileConfig object, which is currently only available for DataCapture profile features. If profileFlag is set to GET and if the profile is present in the internal repository, it will be returned in the extraData object. Use the PROFILE_FLAG.GET option to retrieve the profile (if it exists). Use the profileConfig Object and APIs to modify the feature parameters. Use the PROFILE_FLAG.SET option to save the parameters. This is an overview of how you can create and integrate Profiles using EMDK Profile Manager. Click here to get started with a detailed tutorial on Data Capture Profiles to understand better. There should only be one instance of the DataCapture feature. The EMDK Profile Manager will not allow you to add multiple DataCapture features, but may happen if you are manually editing the EMDKConfig.xml. Other profile features can have multiple instances and may be required in some cases. For example, you may need two 'Certificate Manager' features. The first one to initialize the certificate store and the second one to install a new certificate. The profile features will be applied synchronously in the order they appear. For example, you may want to set the clock before you attempt to connect to a Wi-Fi network. The processProfile method has an overload method that allows sending XML content in the extraData parameter as a String. [profileName]/[featureType]/[feature friendly name in profile parameters] to just edit part of the profile. For example, if my profile is called 'Profile1' and the name I gave to the Clock feature is 'ckEST'. Passing 'profileName' as 'Profile1/Clock/ckEST' will just process this part of the profile. One way you can see how this XML string should be structured is to use the Profile Manager. 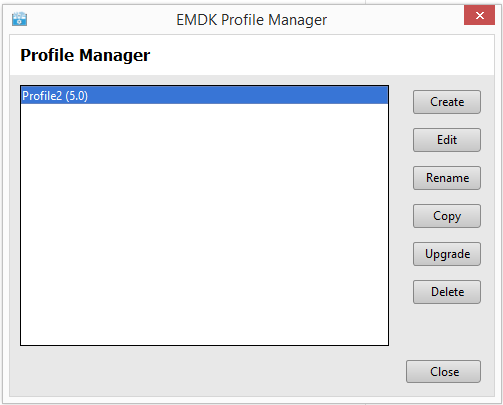 Open any project that does not have a EMDK profile defined already (so you get just the parameters you want to change). 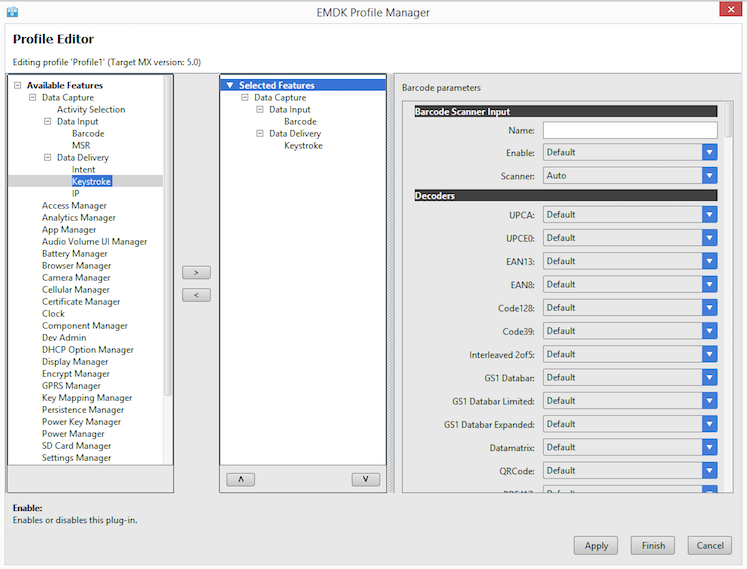 Select EMDK / Profile Manager from the menu. Add the Profile features you want and selection the options you wish to use. Click Finish when you are done with your selections. Notice the XML structure that is shown. This complete structure is to be passed in the extraData parameter as a string. You can choose to copy and paste this into your code to be used. WARNING! 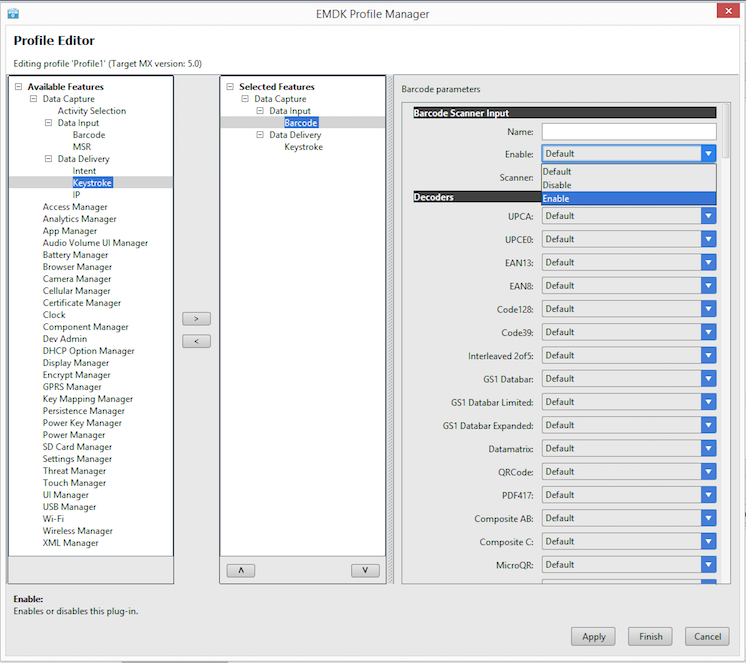 : XML parm names and values may not be the same as what is presented in the Profile Manager wizard. Pay close attention to the fields of interest. It is not recommended to manually edit this XML, use the Profile Manager Wizard to ensure proper formation of the XML structure and values. If the ProfileName node is given in extraData and the ProfileFlag is SET, ProfileName in ExtraData should match with the first parameter passed to processProfile. If the ProfileName node is NOT given in extraData and the ProfileFlag is SET, the content will be merged with the profile given in the first parameter passed to processProfile. If the ProfileFlag is SET and the profile given in the first parameter passed to processProfile does not exist in EMDKConfig.xml, the profile will be appended to the internal repository. DataCapture content (Activity Selection, Barcode, MSR, Intent, Keystroke, IP) is considered as a whole and setting any individual feature will set as a whole. In other words, setting "EmdkSampleProfile-1/Keystroke" will push all the DataCapture features to the device. Specifying a name for the specific feature within a profile. Using the fully qualified name as the first parameter of the processProfile method. 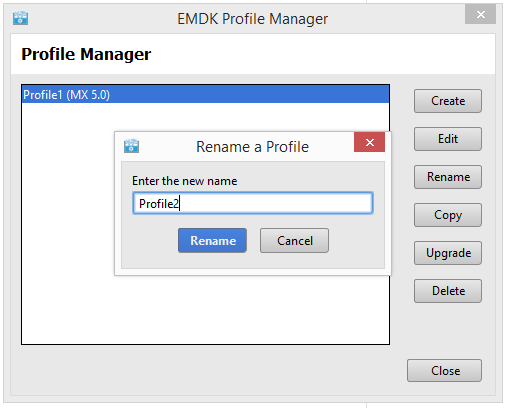 If the ProfileFlag is SET, the emdk_name given in ExtraData should match the third part of the profileName passed to the processProfile method (first parameter). If the ProfileFlag is SET, the emdk_name is NOT given in ExtraData and if the first parameter passed to processProfileis has the fully qualified name (ex: EMDKProfile1/Clock/ck2) , content will be appended to the profile (this only applicable for non-DataCapture features). Profile1 Contains all features in xml No Settings specified in XML will get applied to the device. Profile1/Barcode Contains all features in xml No Settings specified in DataCapture nodes in XML will get applied to the device. Profile1/Barcode/Bar1 Contains all features in xml No Settings specified in DataCapture nodes in XML will get applied to the device given that the emdk_name is set as “Bar1”. Profile1/Clock Contains all features in xml(Clk1 and Clk2) No All the Clock feature nodes are applied to the device. Profile1/Clock/Clk1 Contains all features in xml(Clk1 and Clk2) No Settings defined in the Clk1 node will be applied to the device. Profile1/Clock/Clk2 Contains all features in xml(Clk1 and Clk2) No Settings defined in the Clk2 node will be applied to the device.